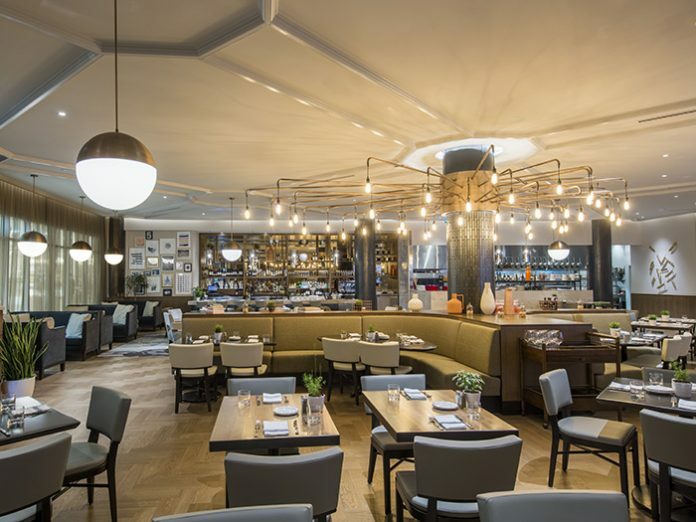 One of Oliver & Bonacini’s latest projects, the beautiful Beaumont Kitchen at Saks Fifth Avenue in Toronto, was designed by Moncur Design Associates in partnership with VISO lighting designers. This fashionable all-day dining lounge was built around a central column which the design team decided to highlight due it being a load bearing structure that could not be removed. The chandelier attached to the column is composed of 53 brushed metal arms, each holding an LED Edison lamp by VISO casting a soft, warm ambiance throughout the restaurant. To attach it to the column, the VISO industrial design and production teams designed it with a metal cuff that is fastened to the column with LED strips, thereby lighting the top and bottom rim for an additional design detail to the chandelier. All of VISO’s custom fixtures for this project were made of high-end materials such as smoke glass, hairline bronze plated metal, frosted glass domes, optical lenses, and high-end polycarbonate to finish the custom restaurant lighting. These materials were incorporated into the main chandelier as well as the other custom pendants designed for the establishment.